Not since 1860 have the Democrats so fanatically refused to accept the result of a free election. That year, their target was Lincoln. They smeared him. They went to war to defeat him. In the end, they assassinated him. Now the target of the Democrats is President Trump and his supporters. The Left calls them racists, white supremacists and fascists. These charges are used to justify driving Trump from office and discrediting the right "by any means necessary." But which is the party of the slave plantation? Which is the party that invented white supremacy? Which is the party that praised fascist dictators and shaped their genocidal policies and was in turn praised by them? Moreover, which is the party of racism today? 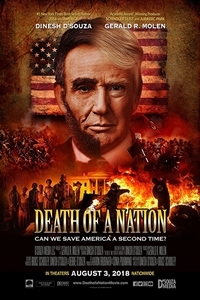 Is fascism now institutionally embodied on the right or on the left?Through stunning historical recreations and a searching examination of fascism and white supremacy, Death of a Nation cuts through progressive big lies to expose hidden history and explosive truths.Lincoln united his party and saved America from the Democrats for the first time. Can Trump and we come together and save America for the second time?